Welcome to the Celebrity Cruises complaints department brought to you by HissingKitty. Experienced poor customer service? We make it easy to file a formal complaint against Celebrity Cruises online. Simply use our free form and your feedback will be instantly forwarded for review. Need to contact the Celebrity Cruises corporate office? We have the mailing address, phone number, and email address listed below. Though the cruise on the whole was very nice (especially the treatment that we received from Nelson in the Trinity Restaurant, the experience I had in the casino and at the front des destroyed any positive comments that I could make. In short - I asked if you were hosting a texas hold-um game and a very rude gentlemen said to come back at 10 and if I got a seat at 10pm it was a cash game with a minimum $200 buy in. I blew it off and played the first night but didn't play the second night as I didn't like the 200 dollar minimum buy-in (heavy handers went all in a lot and 200 on the table is difficult with those type of players) and I didn't like the guys attitude My husband and I played other games and enjoying our friends at the martini bar(we were on the boat with 8 other couples). On the third night I had gotten the daily newsletter and the flyer said that the buy-in for the cash game was only $50 (I have the newsletter still) and was excited as the reduced buy in made it any easy choice for the night. I had gotten to the casino early and mentioned to the dealer i was playing three card poker with that I was going to play hold-um later excited that the buy-in had reduced. He said that he was surprised that Bruce (first introduction to his name) reduced the buy-in since they had done 200 the two nights before and he got takers. Concerned I went to talk to him. I found him in the office and asked him about the game, this is when you lost me as a customer, maybe it was because I was a woman, maybe he is just a nasty SOB but I have never been talked to like that. The man turned to me and said and i quote" why would i reduce the buy-in when i have had a full table every night" when I showed him the flyer he said he didn't care what it said, consider it a mis-print and if I wanted to play I would pay the 200 if that was too expensive for me I shouldn’t be playing. When I asked to speak with his boss, he said she was too busy to talk to me and to come back at 9 and maybe she would and maybe she wouldn’t have time then. I have never been treated by someone as poorly as I was by this man and to have no-one call me or talk to me about what happened even if it was a misunderstanding. If this is the kind of service, you allow then I will never go on a Celebrity cruise again. I previously voiced the following in the online survey with no response. On the 30th august this year my son and I went on a 12-night Iberian cruise on the Eclipse. My sons first and my fifth with Celebrity which I have always advocated as being top of the shelf in cruise liners however sad to say no longer. The service was appalling in the Sunset bar at one point I had waited over ten minutes for service at the sunset bar I was told not so politely I was in a blind spot REALLY, Pool area never once had service I did not have to go to the bar for, Oceanview bar very ordinary and plenty of attitude. To finish off I witnessed a dispute between two staff members at the bar in the buffet area while I and several others waited to be served. Dining room service was exceptional as was our room attendant thank goodness. This year I will be sourcing other cruise liners for a deal as the customer service and attitude could not be any worse than what we experienced. I’m really upset that this happened as I have been a strong advocate for friends and family on behalf of Celebrity. My name is Keisha McKenzie, and I just returned from my vacation on the Celebrity Summit on Oct 21-26. I have been traveling with Celebrity for a few years now and have enjoyed my trips, have met some wonderful crew members who go above and beyond for me to enjoy my time. But, this years trip was not the best experience for me. I boarded the ship excited, energized and ready to relax after a 10 months wait for my trip. Unfortunately, my trip started off a bit rocky, my luggage did not make it to my room and I had to chase it down hours later only to discover it was sitting in the lower level of the ship, with no call or communication from anyone alerting me as to where my luggage was located. I had my medication in the bag and need to take it at a certain time. No one cared enough to alert me my luggage was not in my room due to the steamer being identified in the luggage. I was not aware this was not permitted on board the ship. This could ALL have been avoided if someone just took two minutes to leave me a voice mail in my room or a note on my door. I went to see someone at the front desk and (Joann) was very pleasant and went out her way to assist me. us from coming back as customers. I want my experience to be seamless and easy, especially when I am spending my hard earned money. Fast forward, 10/23(3am) I am attempting to use the remote control in the room and it does not work, the front desk send another remote only to discover the second one does not work as well. So, I am left to stare at the ceiling. Again, it's a small issue; but big to me as I am on vacation and paying for a great experience. Unfortunately, this is the only vacation I am able to take yearly, and would like it t be easy. An oversight may be okay, but when it continues it makes the customer reconsider cruising with other ships. Thank you in advance and hope someone will be reaching out to me regarding my email. We are booked (reservation number #6386583), last name Takx, November 30 sailing o/b MS Celebrity Silhouette, departing Ft. Lauderdale, Florida. We look forward to our first cruise on a Celebrity ship, we have cruised with other lines before. We are assigned cabin #6150 at this time. However, that is very close to the elevators and we would respectfully request a cabin not close to the elevator? Please consider moving us to a veranda cabin away from the elevator? Thank you for replying to me in regards to your Celebrity Silhouette sailing. Although I understand your displeasure with the response, I am empowered to handle this inquiry and have been given the tools necessary to make a decision based on the program of which you booked. After reviewing your reservation with senior agents, we are unfortunately still unable to meet your request to move staterooms. We just need to get the assigned cabin changed to be located away from the elevators. Booked one way trip to Alaska, part of which was SUPPOSED to include inside passage.I intentionally booked it this time of year for greater daylight hours. Despite perfect weather captain traveled ENTIRE inside passage AT Night. I Stayed up late and got up early to see part of it without success. I spoke with members of the crew at the coffee bar and they confirmed they traveled it in the dark. Another Celebrity ship came into Ketchecan after us so perhaps it was cheeper to travel at night for us. Its like going to see a movie and they make you sit in the dark with out turning it on. The next morning I voiced my complaint on board with Nancy Reitenspiess and Bettina at the Guest Relations Office who said they would register my complaint and someone from the company would get back to me when I got home August 2nd(NEVER HAPPENED) There was NOTHING they could or would do for me, though they did admit we traveled inside passage at night and would travel the entire next day at sea.. My room was 8010 and had family in room 8014. While continuing the cruse we noticed pealing paint throughout ship and was informed ship would be totally refurbished this year(SHOULD BE NOW) . I have traveled with other cruse companies, Costa and Silver seas but chose Celebrity because they had a one way that included Inside Passage and Hubbard Glacier. Since no one from the company followed up as I was told. My only recourse Is to voice my displeasure on EVERY travel website as well as call Frommers radio show here in New York so others are aware of Celebrities shortcomings. 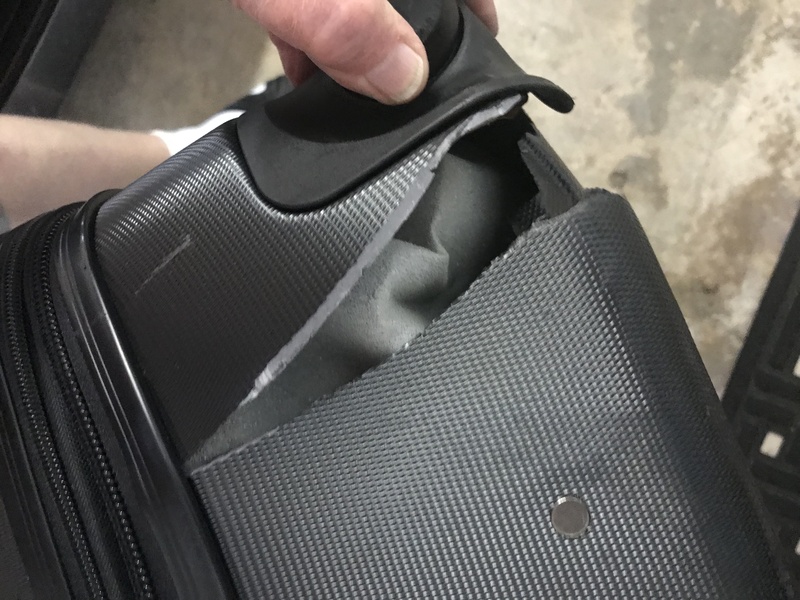 When we picked up our suitcases at the port, we had to catch a plane and we noticed that one of our suitcases was not rolling correctly. When we got in the taxi we noticed a big CUT on the bottom, big enough to put your hand through. We were already in the taxi and couldn't go back to place a written complain. I just called Celebrity and they told me that there's NOTHING they can do because I didn't file a claim which it was impossible for us to do at that time. See pictures attached. We always have recommended Celebrity to our friends and family for your customer service and quality of your ships. We just returned on July 8th. I need an answer from somebody at Celebrity that cares even a little bit. I have purchased the dining packages immediately upon embarking on the ship many times on previous cruises, always being told that there are no tables (2 people) available between approximately 6 - 8 pm. Recently I received a marketing email from Celebrity to purchase the dining package 2 months prior to our upcoming cruise and I booked a package hoping to be able to make a reservation in the specific restaurants that my wife and I enjoy. I found out that I could not make the reservation in the particular restaurants until I embark on the ship. I called Celebrity to file a complaint about this lack of a client satisfaction feature and questioned why would I book this and pay for the package in advance when there was no cost savings and would not be beneficial to my needs. When I spoke to a Celebrity resolution supervisor, I was informed that these dining packages were not available once you embarked on the ship. I told her that I did not believe what she was saying, we all know that not offering these packages on the ship would be a crucial marketing 101 mistake. I have since requested a cancellation on my dining package and a credit on my credit card. If I knew that I would be treated in this manner prior to my final payment, I would have cancelled the cruise altogether, after all there are numerous alternatives to choose from. We were lied to and harassed on the boat about a drink package we lead to believe that sodas and water would be clouded that was not the case. Plus we got home and there was an additional 601 dollars on our checking account so now we are severely over drafted in our checking account with no way to by good or drinks so thank you celeberty cruise by the worse vaction of our marriage. As requested we submitted our feedback by the 27 October and asked to be contacted. To date there has been no follow up with us. I am once again asking for Celebrity to follow up with us otherwise this will be our last cruise with Celebrity. Wannetta Briggs & Jeff Carlisle We provide the following feedback from our 11 day Mediterranean cruise (10-21 October, Celebrity Reflection). The following staff should be recognized from providing exceptional service and excellent customer relations: Room Service Attendant Oscar and his team, Ensemble Lounge Dario, Barista Jose Alexis and Bar Server Ines, and Sommelier Cajetan. They all scored a big 10 from us. The port visit to Santorini was not a good experience. While we recognize that Celebrity cannot control other cruise lines or the local infrastructure to support 3 cruises at the same time better coordination is needed by Celebrity to avoid what I consider as an unacceptable situation. In our case and many other of the Reflection’s guests this visit was nothing more that standing in huge line-ups and overwhelming crowds. Given the choice to wait in line for over an hour for the cable car or walk down the hill, we chose the walk. This was not only unsafe it was extremely disgusting. We booked our 4 specialty restaurant reservations before departing Canada. Upon arrival only 1 was in the system. We conversed with the Food Services Manager and with our Concierge to get this sorted out. Our next challenge was during the cruise to confirm our reservations as no cards were placed on our stateroom number plate. After 3 separate inquires we finally received confirmation of the remaining reservations. The excuse given was that the system was down? We paid for Concierge level and premium drink packages with the expectation that we would not be subjected to room service charges. On pervious cruises with Celebrity we did not have to pay $16.00 to have 2 glasses of wine sent to our stateroom or $10.00 for a salad and cheese tray? We spent close to $10,000.00 for this cruise and you charged us $5.00 for 2 scoops to Gelato. The Concierge level does not provide any enhanced services of value. The afternoon canapes are absolutely terrible and you’d be better off not even providing them! You offer a cheese tray for room service and we could not get this as Murano was not opened? We did receive a cheese tray from the main dining room as a substitute. We applied our shipboard credits to have free internet and gratuities paid. Our bill indicated the gratuities and after 2 inquires with our Concierge this was sorted out. These charges also showed up on our Visa statements at that time. Our Concierge should have left us a message or advised us without having to wait in the queue for a 2nd time. Celebrity must have recently changed the marketing program as throughout the cruise we were subjected to constant sales pitches for excursions, specialty restaurants and an Officer’s reception at the Lawn Grill. This is not consistent with our previous Celebrity experiences and detracted greatly from our overall satisfaction. We attended the Lawn Grill Reception and dinner and it was certainly not worth the $140 we paid in addition to our Concierge Level and Premium packages. Given the above and that competitive cruise lines offer “everything paid” options including excursions, room service and drink packages we will most likely not return to Celebrity. When booking this cruise we chose Celebrity as it offered very competitive prices however once you apply all the extras, this advantage no longer exists. In the future we will pay the extra upfront with “everything included” as opposed to being unpleasantly surprised by Celebrity. It is my hope that we will receive a reply to the concerns indicated above. I bought and paid cabin 3043, for the Suez Canal cruise, onboard Celebrity Constellation, leaving Athens on 2016/11/14. I specifically chose that cabin for being midship and near some traveling partners of us. Today I went to my travel agent to pick up all the documentation (including air tickets, pre paid hotel reservations in Athens and Abu Dhabi, visas, traveling insurance,etc.which always do to double check everything) and was surprised to learn that the system (according to your local agent in Brazil) had changed my cabin and I would now be allocated in cabin 3132 (Aft of the ship). I can not accept this situation, having been specific when making and paying for the reservation, that I would only travel if midship cabins were available. At that date I chose cabin 3043, from those made available to me.Trying to compromise I asked if any other cabins or upgrades would be available. There aren´t any according to them. Having travelled 5 cruises (56 days)with you in the last 2 years, I would never expect this kind of treatment from your company. As it stands I will be forced to cancel my cruise which will bring losses and total satisfaction. My friends and I booked a singles cruise through Single Cruise.com and we informed the agent that we four had health issues of one had back surgery, two had lung surgery, and I myself had fallen down and broken my kneecap and was on crutches. When we got to the stateroom on the ship there were only two twin beds a twin couch and a trundle bed. Now we are over 40 with health issues and the stateroom did not meet our needs. We had informed them our health issues and what we would need which was not what we got he had told us the there would be upper berths. when we voiced our complaint to Celebrity Cruise staff at the reservations desk we were told that there was nothing they could do so we had to endure it. On the third day after my sister had to sleep on the floor I decided to go down and demand that they do something, after an hour had passed they told us that they was going to give us another room and for us not to tell any of the other guest because they did not want other guest coming down to complain about their rooms. We were complaining because that we had paid for a something we did not get. After they gave us the room my sister had to spend the majority of the cruise in the room because she could not move because she was in such pain with her back. My other sister and I spent $1400.00 on spa treatments to try and alleviate some of our pain. what is a slap in the face is that Celebrity Cruise nor Singles Cruise will take ownership. we spent good money on a trip we thought was going to be a great trip instead we got the vacation from Hell. Travelling around the Oceans and Seas are always exciting and with Celebrity Cruises it is much more fun which I had last weekend. I had a cruise tour with wonderful package and services along with my team. They also have shore excursions, Kids & Teens packages, Lounges,Bars,Clubs,Worldwide wine tour and many more on the menu special designed for customer delight. The 2-Story Glass Wine Tower, Captain's Club are the special attractions here. Gambling games, games by ship are also added in their entertainment bucket. Walking and explore to the World of entertainment with Celebrity Cruises. Have feedback for Celebrity Cruises?